Update on the MSU Sugar House Project: Fieldwork has Begun! While Jack and I plan our field research on the old sugar bush that once stood in Sandford Woodlot, we have continued to do background research on the site. With help from Whitney Miller, the good folks at the MSU Archives and Historical Collections, and archaeologist Matt Thomas, we have found out a great deal more about this past MSU facility. Built in 1915, the Forestry Department established this sugar house in order to make better use of the Sanford Woodlot, educate students about the process of creating maple sugar and syrup, and to conduct experiments in order to make the process more productive (1915 Dept. of Agricultural Education Report to the MI Board of Agriculture). While this sugar house clearly had educational and economic purposes, learning about the scientific research that took place there has been one of the most interesting and eye-opening aspects of this project. Image of Sanford Woodlot sugar house, date unknown. Image from May 1973 Michigan Science in Action periodical, pg. 12. Document on file at MSU Archives (MSU info files, 00000.info, Sanford Natural Area folder). When you think about making maple syrup, the process seems pretty straight forward: you tap a tree, collect its sap, and then boil the sap down to make maple syrup. This process has been used for hundreds of years, yet there are many factors that can be explored to improve one’s ability to make maple syrup. Investigating these factors was the job of those who ran the sugar house at MSU. While documentation from the first few decades of research at the Sanford sugar house is scarce, one of the early projects was conducted to understand the effects of different numbers of taps and collection buckets on a single tree’s sap production and health (1916 Forestry Department Report to MI Board of Agriculture). In later years, under the direction of Putnam W. Robbins, a number of different projects were launched. Robbins and his students continued research on tree tapping, examining what areas of the tree are most productive when tapped and when tapping should begin (Douglass 1955; Robbins 1948). In the early 1940s, they also collaborated with the MSU Weather Bureau to study the effects of weather on sap runs. Through this study, they not only narrowed down what types of weather affect sap runs and when it is best to start tapping, but also began broadcasting maple sap-related weather reports on the radio to assist farmers in planning their sap collection. It is these radio broadcasts which are credited for an increase in production compared to other parts of the state and country during this time (Robbins 1954). Plate 3 from Robbin’s 1948 thesis (pg. 13) exploring the effects of tap placement on sap production. This image shows trees with taps and collection buckets focused on the side of the trees that received the most sunlight. Another research project undertaken during this time investigated the role of micro-organisms on both slowing the run of sap from tap holes and their subsequent impact on the quality of the maple syrup produced. Through this work, researchers identified the impacts of micro-organisms and developed a method, paraformaldehyde pellets, to introduce a germicide into a tap hole, helping to increase the amount of time that sap would run and eliminate contaminants that reduced the quality of maple syrup made from that sap (Costilow et al. 1962; Sheneman et al. 1958). In subsequent years, research conducted by other organizations have found that the use of these pellets affected the healing process in trees, leading to a ban on their use (Perkins 2010), but the effects of micro-organisms outlined in these studies is still an important factor to consider for those trying to profit from maple syrup production today. Because of this research focus, the Sanford sugar bush was a central player in the broader sphere of the maple products industry during the early- to mid-1900s. It was one of the few sugar bushes in the country that served primarily as a research laboratory, and research conducted within its boundaries had wide reaching impacts across the upper Midwest and Northeast. Who knew that such a small building could have so big an impact. 1915 Dept. of Agricultural Education Report to the MI Board of Agriculture. MSU Archives and Historical Collections, MSU info files, 00000.info, Sanford Natural Area folder. 1916 Forestry Department Report to MI Board of Agriculture. MSU Archives and Historical Collections, MSU info files, 00000.info, Sanford Natural Area folder. 1962 The Efficiency and Practicability of Different Types of Paraformaldehyde Pellets for Controlling Microbial Growth in Maple tree Tapholes. Michigan Agriculture Experimental Station Quarterly Bulletin 44:559-579. 1955 The Effect of Date of Tapping on the Yield of Maple Sap from Sterile and Non-Sterile Tap Holes. Thesis, Michigan State College. Document on file at MSU Archives and Historical Collections, UA.16.51, box 527, folder 26. 2010 Antimicrobial Silver in Maple Sap Collection. Maple Syrup Digest22:11-20. 1948 Position of Tapping and Other Factors Affecting the Flow of Maple Sap. Thesis, Michigan State College. 1954 “Maple Sap Weather Forcasting: An Aid to Greater Production of Maple Syrup.” Paper presented to the Academy of Sciences Meeting. Document on file at MSU Archives and Historical Collections, UA.16.51, box 527, folder 18. 1958 Correlation between Microbial Populations and Sap Yields from Maple Trees. Food Research 24:152-159. This summer, Cowles House, MSU’s oldest standing building, is due to get a facelift. As part of this remodeling, crews will remove a few trees from around and inside the building and expand the west wing. In preparation for this work, I have been researching the history of this building, as well as what previous CAP excavations have recovered in the area. Completed in 1857, Cowles House was one of four homes built to house the earliest faculty members and administrators of MSU. 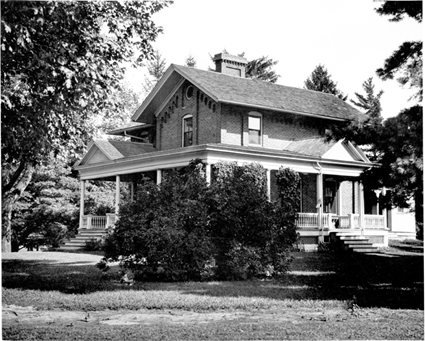 Some of the most prominent individuals in MSU’s history, such as Williams, Abbot, Beal, Bessey, Hannah, and McPherson, all lived in this house during their tenure at the college (Brock 2009; Kuhn 1955). From 1857-1874, Cowles House served as the residence of the college president. After 1874, Cowles House, then known as Faculty Row No. 7, functioned as the home of the professor of Botany (Beal 1915:35, 267; http://archives.msu.edu/collections/buildings.php). A View of Cowles House ca. 1920. Image Source. During these early decades, Cowles house was not only a place of residence, but was also a hub of campus entertainment. Early on, no organized social life existed on MSU’s campus. Students instead gravitated towards faculty homes, where faculty and staff would regularly host small get-togethers (Kuhn 1955:127). The Abbot’s, who lived in Cowles House during their time at the college, frequently invited students and guests into their home. As documented by Kuhn, Abbot had students come to his home weekly to read and discuss literature. They also entertained on the weekends: “On Saturday nights the Abbot home was open to students; twenty or thirty would gather about the fire to eat apples and to talk of politics, of ethics, and of literature” (Kuhn 1955:90). By the early 1900s, Cowles House had been repurposed to serve a broader function. On a 1927 map of campus (MSU archives: http://onthebanks.msu.edu/Object/1-4-114F/map-of-msu-campus-and-buildings-1927/), Cowles House is labeled as “Secretary’s House,” indicating a switch from residential space to a more administrative one. I have not been able to discover more about what this label entails, such as if the house was entirely office space during this time, but it is clear that the space was no longer reserved for faculty use. In 1941, under the Hannah administration, Cowles House once again became the home of the president of the university. As such, the building underwent major renovations after the end of World War II, during which much of the building was rebuilt and a new wing was added to the west end (Kuhn 1955:402). 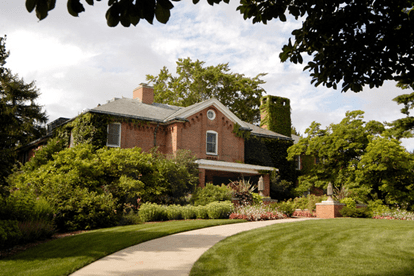 Recently, Cowles House has functioned as an entertainment and banquet space, as recent presidents have decided to live off campus (Brock 2009). Cowles House has been of great interest to Campus Archaeology due to its location within the Sacred Space. As little has changed in this part of campus, this area has the potential for preserving intact archaeological deposits from the earliest days of campus. CAP has conducted numerous surveys around the building, including in 2009, 2011, 2012, and 2014 (CAP Reports 7, 11, and 15), but we are yet to find any clear features or concentrations of materials. Instead, only a diffuse scatter of artifacts has been found around the building. 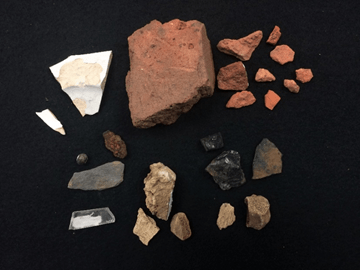 Brick fragments, window glass, nails, and other construction debris are the most common objects found, while a few ceramic sherds, animal bones, bottle glass, and two golf balls have also been recovered. In general, this record is likely the result of construction and remodeling episodes, mixed in with trash from everyday life. While CAP has tested extensively around the building, we have not investigated every area, and plan to survey and monitor intently as renovations take place this summer. We are always on the look-out for that rare deposit that can provide us insights into the lives of the early MSU faculty and presidents! 2009 “Survey Spot: Cowles House” Blog posted on CAP website, Sept. 9, 2009. 2009 Music Building and Cowles House Survey. Campus Archaeology Program. 2011 Walter Adams Field Survey: Archaeological Report. Campus Archaeology Program. 2012 West Circle Steam I Survey: Archaeological Report. Campus Archaeology Program. 1955 Michigan State: The First Hundred Years. The Michigan State University Press, East Lansing. Dating archaeological sites that we discover is one of the most basic tasks that archaeologists perform. While we all must do it, dating archaeological assemblages is not always easy. Luckily, marketing and branding, a crucial part of our consumer world, helps to make dating historic sites a little easier. Every company needs a brand, something that makes them stand out among their competition and reminds the consumer that they are buying a quality product. A great deal of branding is done through material culture, creating visual cues that trigger people’s memories and make them want to buy your product. Like clothing lines, long-lived brands must change over time to keep up with both their competition and the current fashions and culture, leading to variation in the products of companies. This variation, when documented, can help us to date different deposits at archaeological sites. One great example is the Coke bottle. Here at Campus Archaeology, we occasionally come across Coke bottles in various forms. Depending on some particular characteristic of the bottle, we can give a general date to the materials found with that bottle. Coca-Cola first made its appearance in 1886 as a soda fountain drink in downtown Atlanta, GA. Over the next number of years, Coca-Cola was only served by the glass at drinking fountains until around 1899, when the company signed its first bottling contract (Coca-Cola 2011). 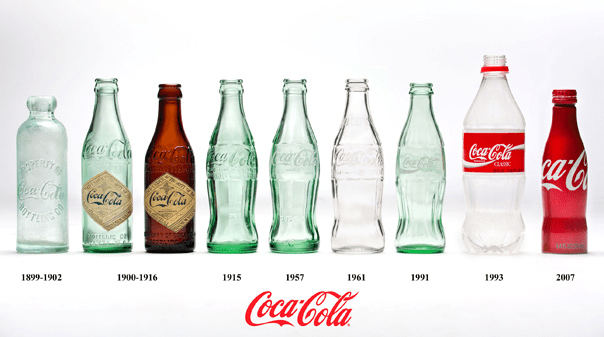 The earliest Coca-Cola bottles were Hutchinson style bottles, but were quickly followed by straight-sided bottles with crown tops in a number of different colors of glass. Dating to between 1900 and 1920, the dates of these straight-sided bottles can be narrowed even further based on the shape of the script and where the script is placed on the bottle. For example, straight sided Coke bottles with script in a diamond shape in the center of the bottle are dated to 1907-1912, while ones with a vertical arrow in the center date to between 1912 and 1916 (for more variations: www.antique bottles.com/coke/). During the time of the straight-sided Coke bottles, the Coca-Cola brand was expanding greatly. As such, competitors tried to take advantage of this brand by closely mimicking Coke branding strategies. In response, the Coca-Cola company had bottle manufacturers create a unique bottle type, one that had a distinct look and feel, which would forever be synonymous with the Coca-Cola brand: the contour (or hobbleskirt) bottle. Patented in 1915, the contour bottle went into production in 1916 and was subsequently sold all over the world (Coca-Cola 2011; Lockhart and Porter 2010). Since the beginning of their production, Coca-Cola contour bottles have changed very little, as this bottle served as the hallmark of the Coca-Cola brand. While the bottle designs stayed relatively consistent, the patent for the bottle was renewed several times. Since the patent date or patent number was included on the bottles to prove that they were from true Coca-Cola distributors, these numbers can help narrow down the date range of when the bottle may have been made. For example, from 1917 to 1928, Coke bottles had the patent date of “NOV. 16 1915” on each bottle. When a different patent was acquired on Dec. 25th, 1923, the bottles eventually began to display this date. From 1928 to 1938, the so called “Christmas Cokes” (due to the Christmas patent date) were produced that possessed this second date. Other such markings are “PAT. D 105529” (1938-1951), “US PATENT OFFICE/MIN CONTENTS 6 FL OZ” (1951-1958), and “US PATENT OFFICE/ MIN CONTENTS 6 ½ FL OZ” (1958-1965) (Lockhart and Porter 2010; www.antiquebottle.com/coke/). Starting in 1960, Coke began selling their products in cans, followed by plastic bottles in 1978, marking the slow decline of the glass Coca-Cola contour bottle (Coca-Cola 2011; Coca-Cola Journey Staff 2017). Close up of bottle from Brody/Emmons Dump showing the Dec. 25, 1923 patent date. 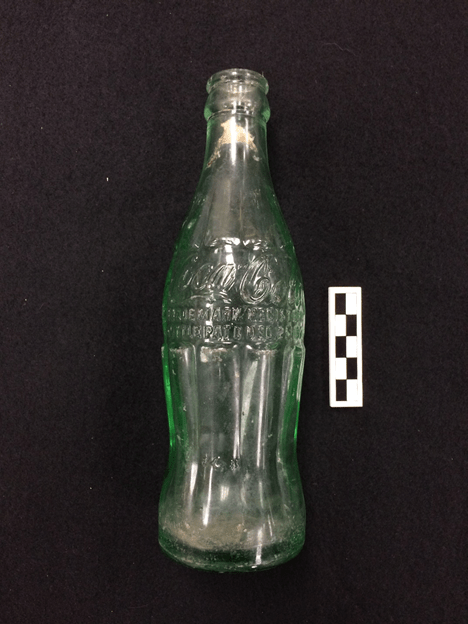 On campus, if we find a Coke bottle during excavation, we know that the deposit dates to around 1900 or younger. We can then use more specific details about the bottle to further narrow down the date range. For example, within the Brody/Emmons dump, an early trash disposal site for East Lansing, CAP recovered at least one Coke bottle. The presence of this bottle indicates that at the dump was being used sometime between 1900 and the present. Looking closer on the bottle, one sees a patent date of Dec. 25th, 1923. 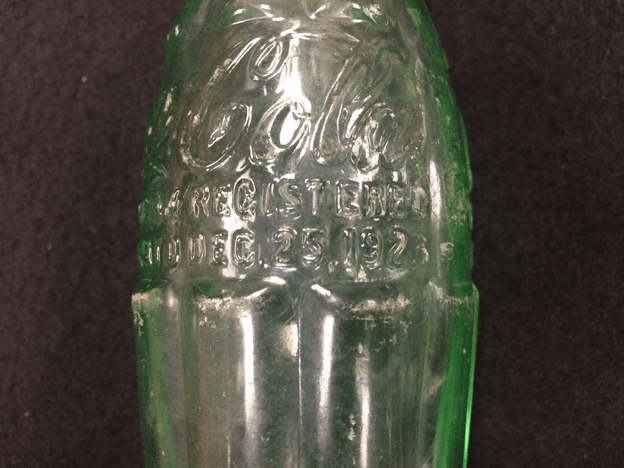 This date indicates that the bottle was an old “Christmas Coke” bottle, made and sold between 1928 and 1938; a date range that fits well with what we know about the use of this dump. Coke bottles, used in this way, serve as excellent diagnostic artifacts for more recent historic sites. But, as marketing never ceases, we must also be wary of recent reissues of old Coke bottles, which promise to confound our efforts in the future. 2011 125 Years of Sharing Happiness: A Short History of the Coca-Cola Company. 2017 “Contour Bottle History.” Coca-Cola Website.